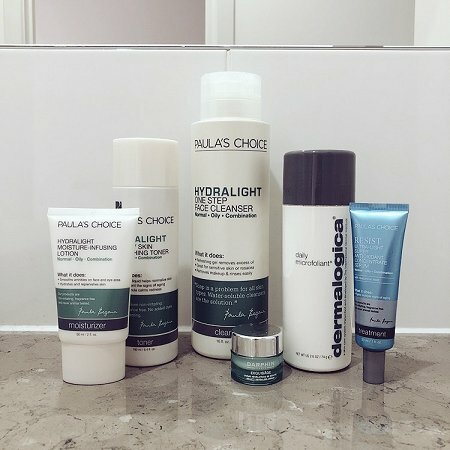 Paula’s Choice Hydralight One-Step Face Cleanser – To the surprise of absolutely no-one, this cleanser gets yet another mention on my blog. Yes it’s still my number one, yes I continue to repurchase it time and time again, and yes it’s still the best facial cleanser I’ve ever used. It does a great job of keeping my skin clear (even from pesky hormonal spots) and works really well with my combination/normal skin. Highly recommend. Dermalogica Daily Microfoliant – This is a long-time favourite that has recently made a come back in my routine. I can easily notice the difference in my skin when I use this regularly, and my skin loves to complain if I skip using this for a few days in a row. I think this is a great cold-weather staple because it provides gentle exfoliation that helps to keep skin smooth and glowing. 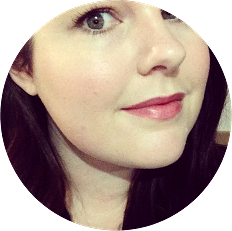 Paula’s Choice Hydralight Healthy Skin Refreshing Toner – I didn’t intentionally pair my toner and moisturiser with my current cleanser, I tend to rotate through both depending on what I’ve got in my cupboard and what I feel like my skin needs at the time. This is a basic toner that I use when my skin is in decent condition and doesn’t need any additional care or hydration. 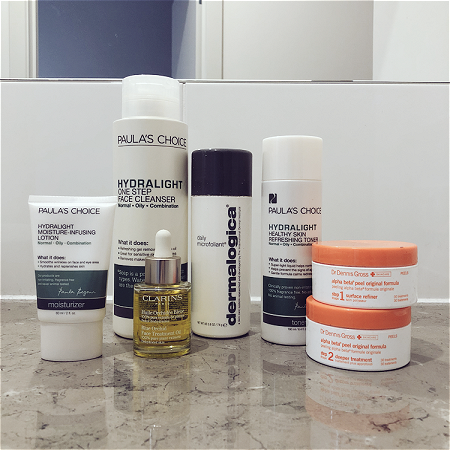 Paula’s Choice Resist Ultra-Light Super Antioxidant Concentrate Serum – This is another old favourite that has made a reappearance in my daily routine. This is a product that I can see almost instant results from, and I’m not sure why I stopped using it for so long. This is a lightweight serum that sinks into the skin quickly and doesn’t leave any sort of oily residue. Paula’s Choice Hydralight Moisture-Infusing Lotion – Because I’m working from home at the moment my skin isn’t copping the full brunt of winter and is not too dry or dehydrated. This is a lovely light moisturiser that I use in both Winter and Summer, depending on how my skin is behaving. Darphin Beauty Revealing Cream – My skin went through a phase of extreme dehydration earlier in the year, and this was my savior during that time. Now that it has settled down and is back to normal this cream is a little bit too heavy to use on the daily, so I’ve switched it up and am using it as a neck cream. I received a Mecca Voucher from my girlfriends for my birthday last year, and decided to pick up a couple of new things to try. One of which was the Ren Flash Hydro-Boost. I had no idea what to expect with this product, as I did absolutely no research before purchasing it. 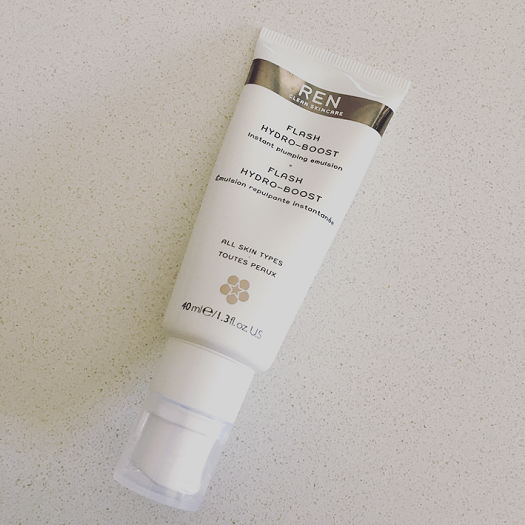 All I knew was that Ren was a highly recommended brand by many of my favourite beauty lovers, and that I wanted something that could add a little bit of extra hydration to my skin. This product is different from anything I’ve used in the past, in that once you apply it you actually have to dab water onto your face to activate it. It sounds a bit weird, but it really does seem to work. I use this a couple of times a week when I feel like my skin needs a bit of an extra moisture boost, and I honestly think that results are obvious on the day that I use it. My skin somehow looks plumper and my makeup seems to sit a lot nicer on my skin. If you feel like your skin needs a bit of extra hydration this summer, I’d highly recommend picking this up. The Ren Flash Hydro-Boost retails for $64 AUD and is available for purchase from Mecca. 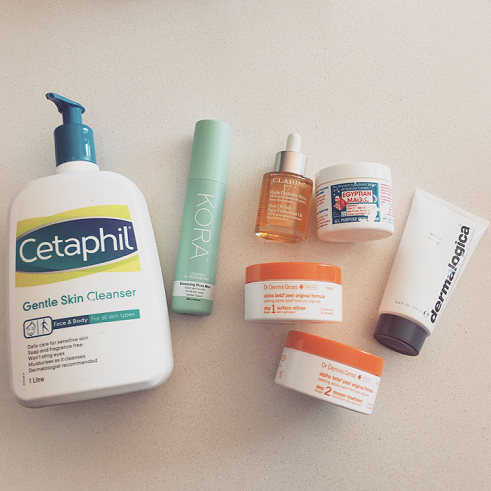 Cetaphil Gentle Skin Cleanser – Because I wasn’t sure which of my skincare products was causing the dermatitis, I stripped everything back to basics. I’ve used Cetaphil for many years as an all over cleanser, and it’s what I return to anytime I need to use something that I know won’t have any negative effects on my skin. I’ve been loving using this lately, it’s gentle on my skin and is a nice break from my standard cleansing routine. Kora Balancing Rose Mist – In my old faithful Paula’s Choice Hydralight toner’s place I decided to use this rose mist that I had forgotten I owned. I really love this, the only down side for me is the spray is hard and doesn’t feel pleasant on the face. Having said that, I don’t remember that happening with previous bottles of this I’ve owned, so I think I might have just got a dud one this time around. Dermalogica Active Moist – This is one of my holy grail moisturisers, and the one I turn to whenever I’m not using the Paula’s Choice Hydralight moisturiser. This is the perfect balance of moisturising and lightweight, and is something I love using around this time of year. Egyptian Magic – I wasn’t sure what to think of this when I purchased it, and to be honest I only bought it because Jessie Baylin noted it as one of her holy grail beauty products. As it turns out, this really is a magic product. I’ve been using this on the areas of my face suffering from Dermatitis, and some how it’s miraculously cleared up dry skin that literally nothing else I have tried has managed to do. 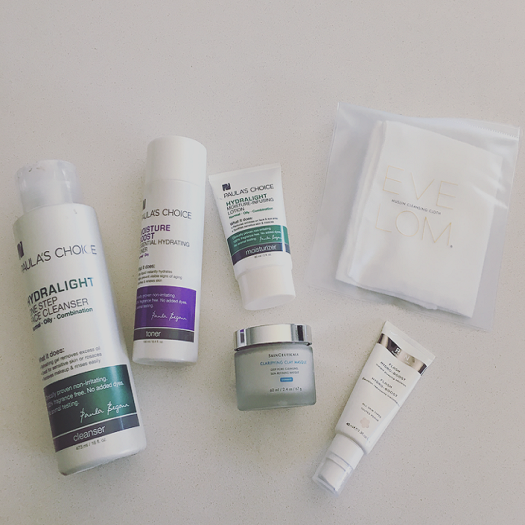 MD Skin Care Alpha/Beta Peel Original Formula – I’m noting this as part of my Spring routine, but really these are part of my ALL THE TIME routine, because I love them so much. I use these wipes once a week as a chemical exfoliant. They’re surpisingly gentle, and work really well with my sensitive skin. If you’re afraid to give alpha/beta hydroxy products a go due to sensitive skin, I’d recommend trying these. Clarins Blue Orchid Face Treatment Oil – I bought this in the hopes it would save my dehydrated skin while we were away in Adelaide earlier in the year, and it did. If I ever have the luxury of a nap, I like to slather my face with this before hand, I always seem to wake up looking hydrated and fresh afterwards.